Don't be shocked if there comes a day, when the demands for platforms to enhance one's skills, is more than the demand for education. Read the journey of a student who was multi-talented and a topper in his education, but, had to create his identity through a platform! Meet Arihant Jain, who was always a topper at academics and involved various other activities, but, it all stopped, when he began his graduation. Let us see how he regained his identity, not just in academics and extra-curricular activities, but also, as a motivator, presenter, leader and more..
Life was plain until his 8th grade, where his focus was, academics and cultural activities of the school. He did score decent marks and win a few prizes, but, a speech of his senior triggered him to participate in competitive exams. He heard his senior sharing that he had cleared all levels of NTS(National Talent Search). He decided to write the exam to prove himself, requested his parents who always supported him in doing all that he wanted. He requested this person, as recommended by one of his friend, to mentor him, who initially disagreed since it was late, as a lot of students prepared for the examination months before, but, on seeing Arihant’s passion, he agreed to mentor him. Arihant worked truly hard to clear the NTS examination, but couldn’t pass. Although he could not clear NTS examination, he learned what it means to work hard, and the whole of his class was surprised to see him top his studies. Arihant himself, was surprised to know that he was never known to his classmates until then. His preparations for NTS helped him clear MTS (Maharashtra Talent Search) and he also happened to become a gold medalist at the International Mathematics Olympiad. He continued to win several other competitions and clear lots of competitive examinations. Arihant was not at all satisfied with the amount of activities that he would do, and hence, decided to learn Martial Arts. He played Taekwondo & Shikai Martial Arts at district and division levels. He also played Oshu at state levels. With all these experiences, he decided to stand for election, for the post of the leader at school and won the election with highest number of votes too. He learned a lot in that phase, organising events, leading teams, at the same time, focusing on studies was equally important or Arihant. He dreamt to join the Indian Institute of Technology, and later his dream shifted to becoming an IAS officer. He studied very hard for his 12th grade examinations and resulted in securing scores that made him one amongst the scorers in the top 1%, of the entire state. Securing admissions at a renowned college of Mumbai, Datta Meghe College of Engineering, Arihant, with a lot of dreams, moved to the city of Mumbai from Dhule. His dreams were shattered in his 1st semester of engineering when he could not really study well, or involve himself in various activities. Semester two, happened to become the “second turning point of life after 8th grade” he says, “I will never forget that day of my life when Bharath GC sir entered our class and invited us for an inspirational talk of the legend, Mr. Sujit Lalwani sir. The talk at Terna auditorium was speechless. I was blown away by just these sentences, ‘Have Dreams. Take ACTION Right now!’. After the inspirational talk, I got a life transforming meeting with Dr. Surendra Ayer Sir, who shared about the amazing platform, i3-influence, inspire, impact. I knew I couldn’t miss this opportunity since I was longing for one. By the time I reached my hostel, I had already convinced my father that I would be a part of i3 and officially became a ‘delegate’ of i3, the very next day. That’s it! There is no more a look back”. He was guided by his mentors, because of which, he got back his momentum, from no-where in the list of toppers in his first semester, to becoming one of the top 3 scorers in his second. He reminisces his days at i3, “Every conference took us to the next level and the projects were designed in such a way that an individual could learn great practical lessons of life, not from another person, but, our own selves. An introvert was now an extrovert, who started exploring the new world, new people, sharing ideas and impacting the society”. Arihant executed various social projects which created awareness in the society, because of which he was nominated for the title of ‘delegate of the week’ several times, but, would not get the title with a small difference between him and those who were tagged sogo. He immediately connected back to one of his mentors at i3, Miss. Jeevitha DM, who is known as the fireball of ‘i3’, who ignited his soul to perform so well in the next project where he happened to create awareness about ‘Digital India’ amongst students of government schools, and impacted 29,000 children in a matter of days. This time, it was obvious that he was not just nominated, but was also tagged, the ‘delegate of the week’. 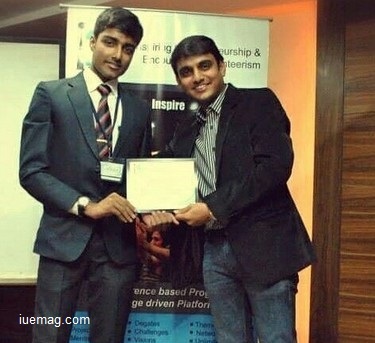 Because of his massive impact, he was chosen to become one of the five True IUITEs of Mumbai’s i3 season 1. “A very big ‘thanks’ to my mentors, from the bottom of my heart! The journey just begins” he shares with pride. 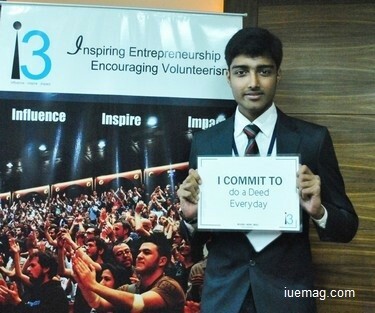 Arihant got an opportunity to work on an international project that was executed for the World Merit Day, on the 24th of July, 2015, when he was chosen as one amongst the 24 lead volunteers from across the country and was the reason to contribute to the record set by the country, of preparing more than 3,00,000 iU NewsPaper bags on a single day. Even today, he gets invites from various institutions for his speech that shall inspire the youth. Recently, he was invited as a guest speaker in his own college, to inspire his seniors of the college. If, as a second year engineering student, he has such a long story to share, none can imagine the list of achievements he shall have when he completes his studies after 2 years. India is only creating more such inspiring individuals who are creating histories at an early age. Prime Minister, Shri. Narendra Modi will be proud to know that, his visions are turning into reality, through such youngsters who achieve with the help of such platforms!